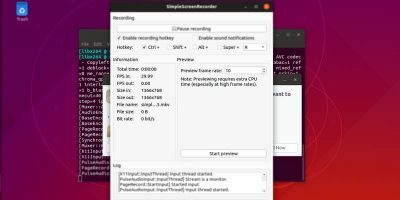 It seems that every year there’s a new music player for Linux. This is not necessarily bad, as it gives us a wider selection of software to choose from. Users can pick a lightweight player or try those that offer plenty of options and services. Cantata is one of the latter, and it has a few features that make it stand out from the rest. Formerly a player with KDE dependencies, since version 1.4, Cantata is now a cross-platform application that only depends on Qt and MPD. 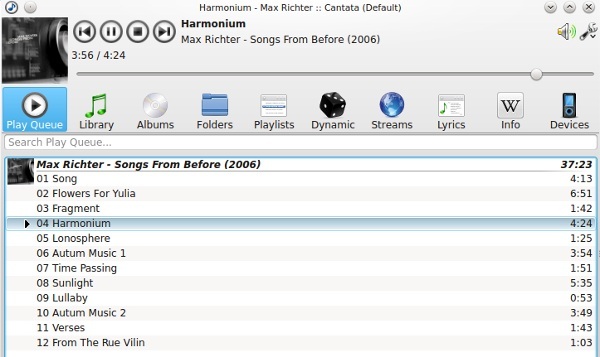 MPD (Music Player Daemon) is a free and open source music server. It runs in the background of your system as a service (or daemon) and requires a client (frontend, usually with a GUI) to manage music and organize playlists. 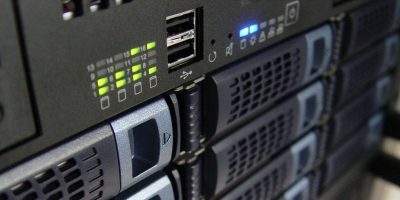 You can use MPD to turn an old computer into a juxebox, connect other computers in the network to it, set it up on a Raspberry Pi configuration and even continue playing music when X crashes or is shut down. Thanks to ffmpeg, MPD can open all popular audio file formats (Ogg, MP3, MP4, AAC, FLAC, WAVE …) and can also stream music over HTTP. Among other things, it supports gapless playback and crossfading. 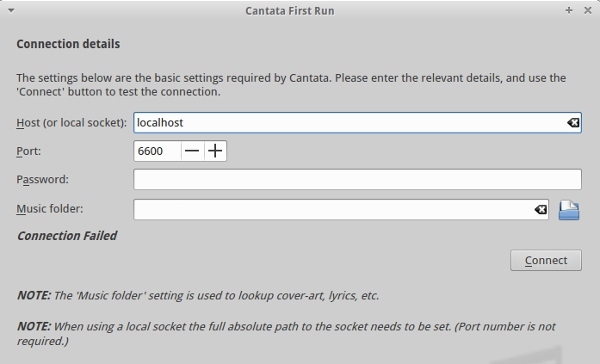 At first run, Cantata will help you configure MPD. MPD plays music from collections or databases created from your music folder. This is why you have to provide the path to at least one folder containing music files. 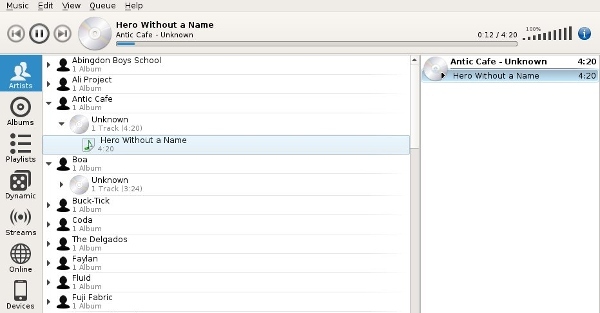 Cantata supports multiple databases which you can add anytime from the “Settings -> Collection” tab. For further troubleshooting, you can consult the MPD wiki. 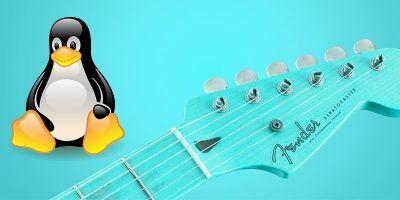 If everything is properly set up, you can start using Cantata to play music from your computer or stream from online radio services like TuneIn, ShoutCast, IceCast and Dirble. 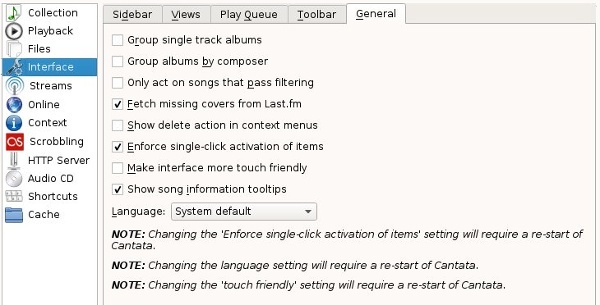 Cantata also supports Jamendo, Magnatune and SoundCloud, and even more online music providers can be installed from the “Settings -> Streams” dialog. The range of customization that Cantata offers is amazing. Options are grouped in tabs where you can adjust everything from tooltips, song grouping, background images and playback fade-out to lyrics, Last.fm scrobbling and custom keyboard shortcuts. Multimedia keys are also supported, and Cantata can copy music to and from USB and MTP devices and even rip audio CDs. 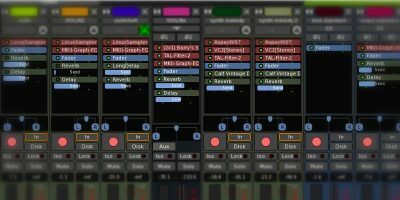 The best thing about Cantata is the incredibly flexible interface. By default, Cantata is divided into panes with playback buttons at the top and a small toolbar at the bottom. 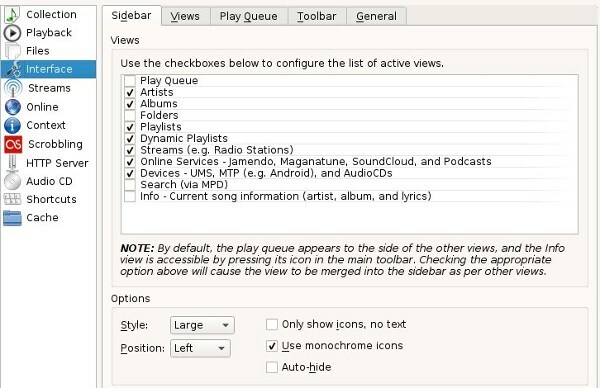 You can access your playlists, folders and streams from the toolbar and preview and select music in the tree-view pane. The queue (playlist) opens in the sidebar on the right where you can right-click any track to access the context menu and change tracks’ priority, organize files, add them to playlists or copy to a device. You can also show and edit current song information and edit tags directly from Cantata. If you don’t like the default look, you can put the toolbar on top and organize your files into one of three views: Library (tree view grouped by artists or albums), Album (with album covers shown as thumbnails) or Folders (like in a file manager). The Folders view is the most practical for managing your music, and you can also open the file manager from there. The Settings dialog hides even more options. Here you can choose which parts of the interface will be visible and set the size, position and color of icons and text. Apart from the full (expanded) layout, Cantata also has a mini interface which you can enable from the View menu. Another feature that puts Cantata above other MPD clients is the fact that it caches a copy of the MPD database. This helps with faster file copying and seamless sorting and enables quick access to music files for building dynamic playlists. These playlists are based on rules or filters which you choose when creating them. Criteria for filters include genre, year, artist, track and album names, and this information is obtained from metadata tags. Advanced users might enjoy Cantata’s hidden features which can be enabled in the “/home/$USER/.config/cantata/cantata.conf” file. For example, you can force Cantata to use any icon theme by editing the iconTheme= value or adjust volume increments by changing the number after volumeStep= value. Cantata is among the most powerful music players I’ve used. Although it takes some time and effort to set up and get used to, it’s a pleasure to use because you can make it look and behave exactly like you want. Have you tried any other MPD clients? Leave your recommendations in the comments. Holy Crap! For years I used different heavy weight GUI music apps, from RhythmBox to Amarok. Then I decided I wanted something a bit more lightweight and started searching for the best lightweight music app that would fit my specific needs. I hopped from one to another for years, using apps such as Audacious and others. Eventually I settled for MOC, and used it for a very long time. 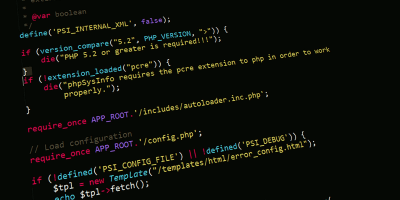 My move to MOC was prompted by a personal quest to use as many command line applications as possible, for work and play. About a year ago I read an article about mpd and I thought it sounded like the best option for me. So I set up an mpd server and started using mpc as the client. I love this set up, but every now and then I’ll be listening to an artist that I’m not too familiar with and I’ll have to look them up in wikipedia, or I’ll want to know the lyrics for a song, again I’ll have to look it up. I decided to TRY cantata because of this article, and now with it set up and music blaring on my speakers, I started poking around the app, it’s settings, views etc. I found the button to the right of the volume slider, which looks like the letter ” i ” inside a white circle. I clicked this button and it gives me all the info on the artist and the lyrics to the song currently being played. This is the perfect music app for my needs. It seems very polished and lightweight, as much as possible. I love the fact that it connects straight to my mpd server and also the option to add other mpd servers. 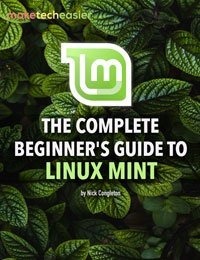 By far, one of the most useful articles I’ve read on this site. Thank you so much for turning me on to this program. I believe, because I like it so much, I will even see if I can be of any help to the developers. I want to ensure an application such as this never gets lost or forgotten by users, future, past and present, and also by the devs. Thanks again….lovin’ it! Thank you so much for describing your experience! You have no idea how happy it makes me that you like Cantata :). 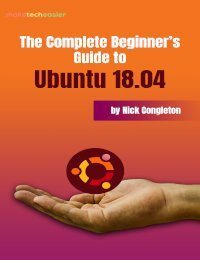 Can Cantata be installed & successfully run on Ubuntu 12.04? I may just pick up on the explanation on that page — it looks pretty detailed. Thank you for the tip, Ivana! (Love yr name btw.) Cantata does look nice. No problem ;). Just make sure to read all posts in that discussion, since the author added more tips and corrections later on. I’m sure you’ll succeed, but if something goes wrong, feel free to contact me and I’ll try to build a .deb package for you. Yes, I noticed that. Wow, thanks, you’re the best! Just stumbled upon this music player and installed on both my Linux Mint 17 and my Win 8.1 computer. On both systems I am stuck at the first run dialogue which asks for basic connection settings. I don’t seem to be able to provide any answers that satisfy Cantata (i.e. host, absolute path to socket, etc). Sorry for my ignorance but I tried to look up for this info and never able to find any online. 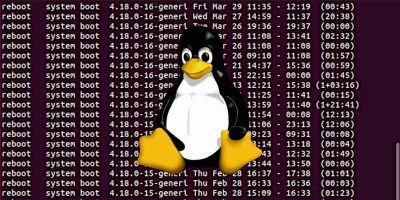 1) Host (or local socket) – does this mean hostname (e.g. computer name in Windows, the IVP4 address)? I tried both and they never worked. I also left the default text ”localhost’, but this still doesnt work. 2) Port: default is 6600. The note on the dialogue says when using local socket… port number is not required. I remove this number but the dialogue box fills it for me each time. When I click connect, it says connection to [host] failed, no matter what combination of what I put for host and password. Hi, I’m really sorry you’re having problems with Cantata. Let me ask you a dumb question – have you installed mpd first? As you probably already know, Cantata won’t work without mpd, so you need to install it. In my case, I didn’t change any of the settings in that configuration dialog. I left everything at default and only added a path to my music folder, and it worked. Make sure mpd is running before you start Cantata, and then try again. If it still doesn’t work, maybe you’ll have to check mpd’s configuration file. 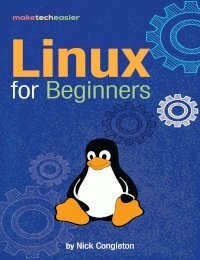 It can be installed on Windows ? Thanks for this review – I found out about Cantata because of it and have finally found my ideal music player on linux! If only there was a Windows version too I’d be covered everywhere! Don’t know how I missed that there is a Windows version available! Thank you very much for making this jewel…! Hi, great article, im using Manjaro 15.09 (Bellatrix) Kde Plasma and it comes with Cantata, is there an EQ anywhere in Cantata? Or is there an easy way to install one? Would be nice to have an eqalizer.